When the indomitable and fearless Mike Zellhoffer, Executive Director of Third Wall Productions (TWP), first told me he wanted to mount a production of “Newsies,” (music by Alan Menken, lyrics by Jack Feldman, and book by Harvey Fierstein), I said, ’You’re out of your mind.’ Why would a local theatre company want to tackle this dance-centric show unless the powers that be have taken leave of their senses? The answer is on display now at St. Thomas Episcopal Church, home base of TWP. It’s because they can! Newsies first found life as a Disney movie musical back in 1992 (seems longer though). Starring Christian Bale and Ann Margaret, it was something less than a rousing success. Full of raised-fist anthems like “I’m the King of New York” and “Seize the Day,” it’s the based-on-real-events tale of the street kids who sold the daily newspapers (papes) on the streets of New York circa 1899. Debuting on Broadway in 2012, the musical found a second and much better-received life, winning Tonys for Best Choreography and Best Original Score. This production is as ambitious an undertaking as I have ever seen on a local non-equity stage. First-time Director Henry Cyr has done an outstanding job overall corralling the myriad elements and details needed to pull off a show of this size. There are a number of noticeable shortcomings, however, that make this freshman outing a bit of a challenge. Overall pacing is taught, though there were a couple of instances where the cast seemed a bit more than hesitant about whose line was next. Cyr’s pacing was helped along by what was essentially a single set with a piece added here or removed there to depict various locales, so precious little time was wasted during scene changes. The action was well planned, though the fight scenes would have benefited from a little more rehearsal. When staging mayhem, hot and hectic goes a long way. Music Director W. William Zellhoffer does a fine job with the large cast, skillfully guiding them through harmonies and solos with a deft touch. The orchestra seemed a bit overwhelmed by some of the more intricate passages and the sound level was often overbearing. But when they played well, it was a joy. The clever set of way too modern scaffolding was well-intentioned but the use of lighting on the metal that looked right out of a 90s disco was a bit jarring given the time period of the piece. The costumes were mostly appropriate and nicely portrayed the times. “Newsies” became a hit on Broadway due to the incredible dances performed by some of the best male dancers in the business. TWP used the talent that was available to them and consequently the dancing chorus is comprised of far more girls than boys. Now there’s nothing wrong with a bit of gender bending and goodness knows I’m no stranger to it myself. There is no problem with this mixed group and these kids make up for any technical deficiencies with enough sheer hutzpah and pizzaz to power a locomotive. They handle the choreography by Cecelia, Lucy and Maia DeBaugh with a dedication that is palpable. They try SO hard and that endears them to the audience. The choreography is almost beside the point. It’s obvious the choreographers wanted to go all out and did an admirable job, particularly with the tap number. But the amount of heart these kids put into every move raises the dancing to a whole ‘nother level. This is a huge cast and too many supporting characters to mention but standouts for me were Bailey Gomes as the wise-cracking little scene stealer Les; his big brother Davey nicely brought to life by Logan Snyder (who is a better dancer than he thinks he is), and J Parnell Hargrove as Weasel, with a raspy and near perfect New York accent that could peel the paint off a wall. 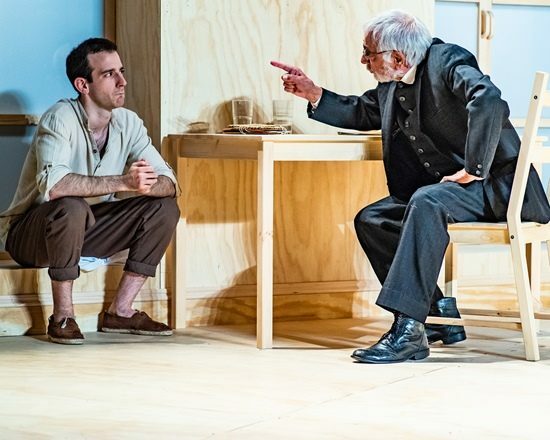 The character of Crutchie is usually played by a young guy but we have in this production one Sarah Mackin who, for me is worth the price of the ticket. This kid is a knockout and is tough, funny, upbeat and can rip your heart out. She’s everybody’s kid sister and I confess when she sings her signature song from the children’s prison, I cried. Not something this jaded ol’ diva does often. “Newsies” rises or falls on the shoulders of the character of Jack Kelly. Andy Collins is damn near perfect in this part. He’s brash and full of spit and vinegar. Or he’s tenderly plaintive and full of longing. Or ashamed and beaten down (but not for long.) Whatever the moment, Collins is 100 percent in it. His singing is spot on and full of heart, especially on the Act I curtain song, “Santa Fe.” Just wow. Shut up and pass me a tissue. And that is what separates the good from the excellent on a stage. I don’t know him but I’m certainly gonna keep my eye on him. This guy has something to offer area stages and I’ll look forward to it every time. 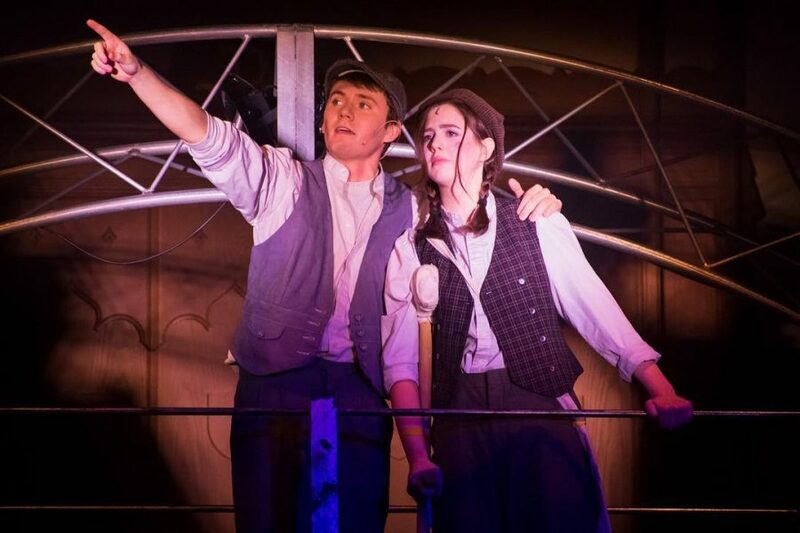 “Newsies” plays through February 17, 2019, with Third Wall Productions at St. Thomas’ Episcopal Church— 1108 Providence Road in Towson, MD. Tickets are available for purchase at the door or in advance online.